With its classic sharp cheddar taste, this award-winning cheddar is the cheese no kitchen should be without. Melt it in a grilled cheese sandwich and you're likely to be labeled a culinary Ninja. Perfect for all-around grating, cooking and melting. It has a creamy, smooth texture and a slightly acidic taste. Nuances of sweetness are balanced with a rich buttery tang. Cabot fans will tell you to pair with sweet tart apples, Bartlett pears and crusty sourdough bread. Finaliy a sliced white chedar thats real cheese! Melts great. 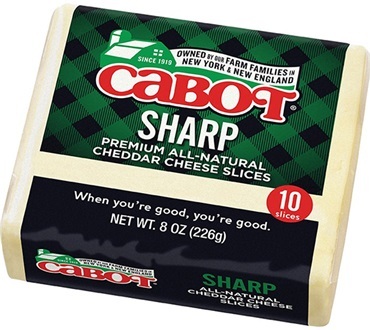 Has the flavor of the block white cheddar from cabot. First buy for these,have loved the blocks for years. Have eaten Cabot block cheddars for years but have never seen the sliced till I found it here. Its great for sandwiches, Love it ! Haven't tried melting it yet, need to make a grilled cheese with it. Yum. Taste great, with all ingredients I can't eat taken out. BEST CHEESE OF ALL & I LIKE THE SLICES A LOT! THIS IS THE BEST CHEESE THAT DAKIN MAKES IN MY OPINION! I love all Cabot cheeses. I'm lactose intolerant as well as my young daughter. I was thrilled to find a great tasting, cleanly made alternative to all the other cheeses out there. This aged cheddar line, having no lactose has opened a whole new world for us. I cook a a lot and I now only buy your cheeses.